Considering that many people can speak at least two languages, those who can only use their mother tongue will sometimes find it to their disadvantage. Besides, learning a second language is a great way to remain intellectually active and can be quite fun, if one is sufficiently motivated and interested. So what is the best way to learn a second language efficiently? By understanding how languages are learned, we can teach them in a more effective fashion. Is there a unique way to learn languages (and thus to teach second languages) that is considered better than most, or does it vary depending on the individual and the way he assimilates knowledge? I have chosen one precise aspect of one particular language to better explore a way of learning a language. In this case, I have decided to write about James W. Heiseg’s method of learning the Japanese Kanji, those sometimes-complicated symbols used in written Japanese. In his book, “Remembering the Kanji," Heisig explains how he managed to remember the general meaning of more than 1,900 Kanjis in just over a month. This may seem like a lot in such a brief period, but according to him, it is definitely possible. Keep in mind that Heisig studied Kanji intensively and that it was his main occupation during that month. The general idea is to deconstruct an apparently complex Kanji and then to reassemble it by adding a meaning to the sum of its parts. By using the meanings of the various parts of the Kanji, one makes a story that links each meaning to a general representation of the Kanji. In the next section, we will provide an example that will allow you, as a teacher, to better understand the method and put it in use in your classes. Let’s look at a common Kanji. The general meaning of this Kanji is “village." Some people will try to remember it by repeatedly writing down this same character. The problem with this technique is that they will not be using the Kanji anytime soon so, there is a good chance they will forget both the meaning and how it is written. So what to do then? Use flashcards? That can work as well, through repetition. What if there was an easier to way to remember this Kanji, though, without going through the hassle of flashing the same card hundreds of times or writing the same character over and over again? This is when the Heisig method comes into play. The idea is to use your imaginative memory instead of your visual memory. “[…]if we could discover a limited number of basic elements in the characters and make a sort of alphabet out of them, assigning to each its own image, fusing them together to form other images, and so building up complex tableaux in imagination, the impasse created by purely visual memory might be overcome." Suppose the square shaped symbol (#1) represents a field in your imaginative memory. Picture a rice field in your mind, flooded with water with green sprouts scattered here and there. That is half of your kanji already vivid in your memory. Now look at the “T" shaped character on the right. With little to no effort, one can see a certain resemblance to a sign, such as a street sign. Imagine a sign, wooden and weathered. 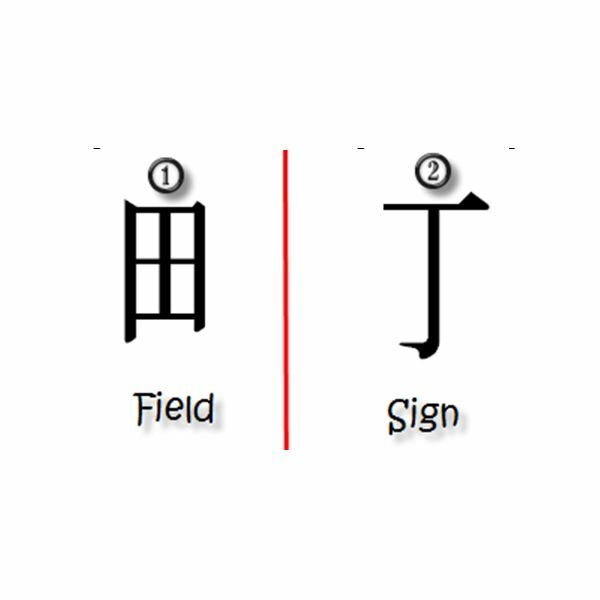 Now that we have depicted both “elements" of our deconstructed Kanji in our mind, it is time to, as Heisig puts it, fuse them together in a third and final mental recollection. The idea here is to put both visual memories in a third one, which represents the general meaning of the Kanji that is to be learned, in this case “village." In other words, all is left to do is to imagine a field at the entrance of a village in the distance with a sign next to it, indicating the name of the village and how far it is. Of course, there is not a single story for everyone and it is best if you come up with you are a story of your own that is going to be the most vivid in your mind. Granted this might seem like a lot of effort for just one Kanji but from my personal experience, it will take you a lot less time than writing the same character repeatedly or using flashcards. Besides, isn’t making up your own tales for each Kanji a whole lot more fun?